Hi Carrie just an update for you and if you’d like to share with the class, Ryan and my experience over the last 5 days... this is our story and I want you to know that your classes put Ryan and in the front seat and in control of a crazy ride. Rain Franziska Barnes was born at 4:45 am 4/3/18, She is 26 weeks prem and weighs 900 grams, she is doing really well so far. She is in ICU at Royal women's Brisbane and will stay here for at least the next 6 weeks till she is old enough to go to Sunshine Coast uni hospital. I am doing better than fine and was discharged 7 hours after her birth. We’re at Ronald McDonald House where we will stay now. Sunshine Coast gave me my first steroid shot and panadine fort, directed me straight to RBWH via ambulance, when I arrived I was already 2 cm dilated. RBHW gave me magnesium sulphate and more pain meds to slow the contractions - to almost a painless Braxton Hicks by Saturday morning. So it wasn't until Saturday night (my Birthday!) that the intensity of 4 in 10 started which then lead to Rain's arrival Sunday morning. We were visited by consultants who told us of the risks we faced, gave me flyers on cesarean sections and social workers came. Rain was head down from my arrival to RBWH. I told the midwives I would have a natural drug free birth and would not entertain a cesarean unless absolutely necessary. Her heart was monitored and I knew she was strong and was told this throughout our time in the birthing suite. I delivered a natural birth, I didn’t get the choice to breath her down, I had to push, I understood this was not an option and my body told me so also. I couldn’t choose my position (however missed that class so didn’t know any alternatives, haha) based on the circumstances either and I acknowledged this was for safety of Rain also. When I was fully dilated I imagined the flower opening and prepared myself for the intense race to the end that was required. My body kicked in offering me minimal time in between my final contractions, I was a passenger and knew my body and baby knew how to cope. I felt the intensity of the pain however I felt in another place as my body released euphoria to keep me focused. Ryan constantly got me water, cold cloths, spoke for me and shielded my eyes from the light. He held my hand and reinforced the balloon breaths with me over and over. When it was time to ‘push’ he encouraged and reassured me. He was a solid rock and so prepared based on what we have learned with you. I have one 2nd degree tear which I declined to get stitched as it was not a risk. Because of the natural birth path I had chosen, I was able to produce colostrum to give to Rain on the day she was born. I was discharged ASAP and could rest privately in Ronald McDonald House. I gave birth and not 5 minutes later asked for some tea and toast as my stomach rumbled, that shows just how natural child birth is. Thankyou for what you have taught us. 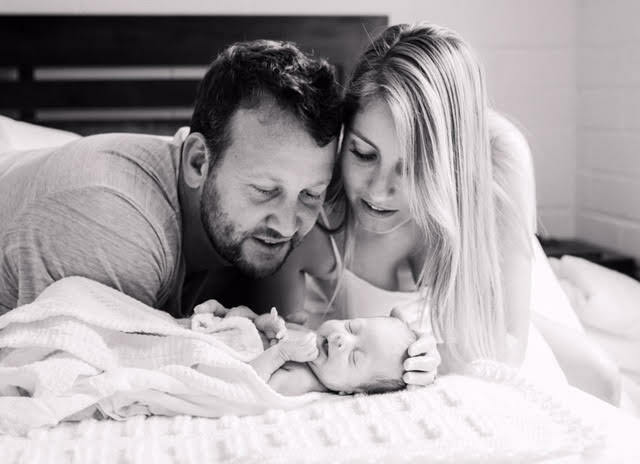 Our story is successful in our eyes based on the circumstances, I feel we made the right decision for the best possible, safest outcome for our daughter and we both are proud of our choices and we have no ‘I wish we did this’ thoughts. Ryan and I agree without your classes our situation would have been out of control, stressful and uneducated. Thankyou. Stacy, Ryan & Rain. ​Rain came home to the Sunshine Coast 12 weeks later, thriving at 2.5 kgs. I was a passenger and knew my body and baby knew how to cope. I felt the intensity of the pain however I felt in another place as my body released euphoria to keep me focused. 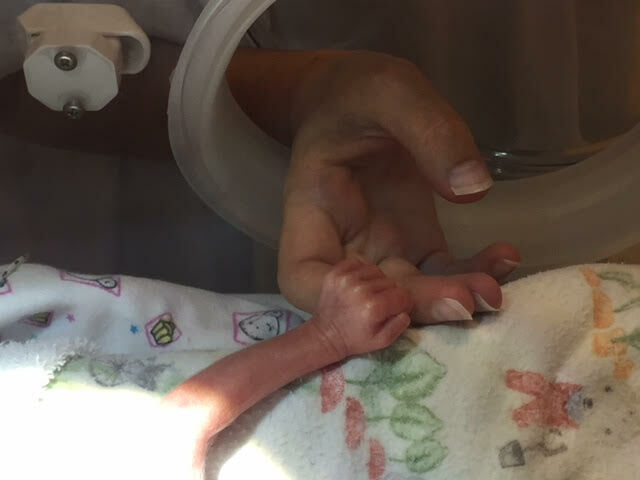 Rain was born at 26 weeks prem and weighed 900 grams. Ryan and I agree without your classes our situation would have been out of control, stressful and uneducated.